1927 would prove to be momentous year in American history. Prohibition had now entered its eighth year yet Americans were consuming more alcohol than ever. The Mississippi river had flooded bringing about one of the worst natural disasters in American history. Baseball legend Babe Ruth and the New York Yankees continued to shatter every record in the game’s history and US President Calvin Coolidge marveled at the booming stock market which was turning regular Americans into millionaires. Yet it was the achievement of one American, Charles Lindbergh, which would forever mark that year. For on the 21st of May the young pilot landed his plane on an air field in France thus shattering man’s last barrier- gravity. 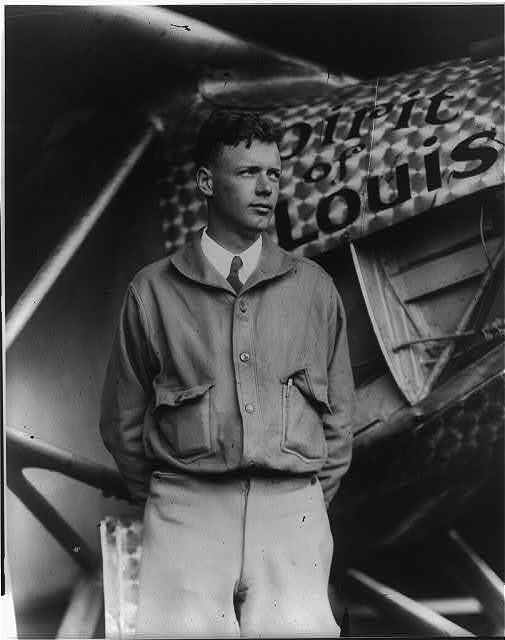 Upon returning to the US Lindbergh was welcomed by one of the largest crowds ever assembled in one place. A radio broadcaster, who was covering this home coming, was about to make history himself as his radio broadcast was carried by some fifty radio stations simultaneously. It was the first coast to coast radio broadcast in US history made possible by the newly formed National Broadcasting Company (NBC). As Bill Bryson writes, up to that day no person in history had ever talked to so many people at once. Nowadays, mass broadcasting seems almost trivial. A major foreign policy address by an influential world leader is carried at once to living rooms throughout the globe. Yet what is amazing is the speed at which world leaders now attract mass audiences. This was the case earlier this week when a twitter account supposedly operated by Palestinian President Mahmud Abbas suddenly popped up on twitter. While the account turned out to be fake, the amount of people it attracted in its 20 hours of existence, and their identity, sheds light on the manner in which twitter may be used by world leaders. 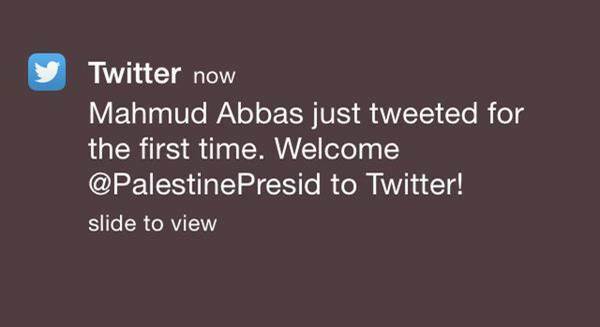 I first received notice of Abbas’s new twitter account at 18:35 in the evening. By then, the account that had been active for only three hours had attracted 1,899 followers. What was most striking was that a large proportion of these followers were Israelis. These included two influential Israeli journalists, Nadav Eyal (a foreign affairs commentator on Channel 10 News) and Ben Caspit who writes for several publications. Moreover, Abbas was beginning to attract attention from Israel’s diplomatic core. Israel’s Embassy in Washington was following Abbas as was Yoram Morad, Director of the Israeli MFA’s Digital Diplomacy, and Ofir Gendelman, the Israeli Prime Minister’s Spokesperson for the Arab Media. It is fair to say that through these followers, Abbas was in a position to communicate messages to the heights level of Israeli policy makers. Yet this was just the beginning. By 19:36, four hours after the fictitious account was launched, Abbas had amassed 2,100 followers. With regard to Israeli audiences, these included directors of two high profiled Israeli NGOs: Shalom Achshav (a settlement watchdog) and Betzelem, an NGO focusing on human rights issues. Israeli journalists were also swarming to Abbas’s channel threatening to flood his account like the mighty Mississippi. These included commentators from Israel’s most watched television newscast , reporters from the Haaretz and Yediot Aharonot newspapers (the latter being Israel’s most read newspaper) and even the editor of Time Out Tel Aviv. It is the latter that best demonstrates what a smash hit Abbas was proving to be among Israeli social media users. Finally, the number of Israeli diplomats and mission following Abbas also steadily grew and now included several diplomats stationed at the Foreign Ministry in Jerusalem as well as the spokesperson for Israel’s embassy in London and the political officer in Israel’s embassy in India. The following day, as the Abbas account neared its end, it had attracted more than 2,200 followers. These included three high ranking diplomats in Israel’s MFA, the spokesperson of the Israeli Labor party, journalists from popular new websites, journalists from Israel’s leading English newspapers (e.g., Times of Israel, Jerusalem Post), popular defense commentators and even the manager of Israel’s public radio station. Never before had a Palestinian leader become so popular amongst Israeli audiences nor was a Palestinian leader ever able to potentially communicate with such a large Israeli audience. Of course the fact that Abbas attracted so many influential Israeli followers does not attest to the manner in which he is perceived by Israelis. Nor does it indicate whether they view him as a partner for peace. But what it does suggest is that through twitter Abbas could have communicated with vast numbers of Israelis and, perhaps more importantly, communicate directly with the Israeli media which has a profound impact on the manner in which is viewed by Israeli society. If online engagement is viewed as long term process, than direct communication between Abbas and the Israeli media may have eventually led to a certain thawing of relations between Palestinians and Israelis. By using twitter, Abbas may have also been able to communicate and engage directly with regular Israeli social media users. This, in turn, may have facilitated real change in Israelis’ willingness to view him as a partner. The majority of Israelis have never engaged with Palestinian leaders and only learn of these leaders’ actions through the media’s prism. Direct communication between Israelis and Abbas could have potentially shattered stereotypes and misconceptions. It would have also enabled the Palestinian side to articulate its graveness’s and solutions to the current conflict. It is this potential use of twitter that demonstrates digital diplomacy’s ability to serve as a peace building tool. Alas, Abbas was never really on twitter, and direct communication between Israelis and the Palestinian leadership remains an insurmountable barrier to peace, much like gravity was in the beginning of 1927. The second group of followers was comprised of journalists from international new outlets. These included the BBC, the New York Times, Bloomberg, the Financial Times, the Guardian, Le Monde, Newsweek and foreign correspondents stationed in Lebanon, Teheran, Saudi Arabia, Iraq and Egypt. NBC’s broadcast of Lindbergh’s historic greeting in New York pales in comparison to the global audience now in the Palestinian leader’s reach. This small analysis indicates that journalists and diplomats are the first to follow a world leader on social media. This could be attributed to the fact that such twitter accounts have become important sources of information. Journalists now routinely use these accounts in order to find new stories or complement pieces dealing with foreign policy, geo-politics and regional conflicts. Diplomats also use twitter in order to learn of new foreign policy initiatives and anticipate future initiatives by foreign countries. Interestingly, all of Abbas’s fake tweets dealt with the latest Palestinian initiative- seeking a UN Security Council Resolution with regard to the end of the Israeli occupation. In other words, the forger knew what he was doing. It is important to note that by the time Abbas’s account was revealed to be fake, no world leaders and no foreign ministers were following the Palestinian President. This is surprising given the fact that world leaders now follow one another on social media thus creating online networks of information. It’s possible that world leaders like to “make an entrance” and thus begin following one another after the first wave of followers has descended on an account. Or perhaps, like President Coolidge, they were all too busy marveling at the economy and the steep decline in the Russian Ruble. Posted in Uncategorized and tagged Digital Diplomacy, Israel, Mahmoud Abbas, mass media, media, Palestine, Peace, Twitter. Bookmark the permalink.